ABC Pediatrics provides all routine vaccinations and immunizations for your child from birth, through grade school, and including college entrance requirements. Immunization records are kept securely in your child’s Electronic Medical Record and are also recorded at the North Carolina State Immunization Registry. For your convenience, your child’s immunization record is easily accessible through our online patient portal, via phone request (910.892.1333, ext 2227) or in-office request. The safety and effectiveness of vaccines in preventing serious or life-threatening illnesses has never been more clear as it is today. 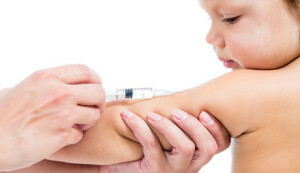 Supported by years of research, ABC Pediatrics strongly suggests vaccinations for your children to provide the best protection available against known life-threatening illnesses. If you have any questions or concerns with regard to immunizations and/or specific vaccines, please call our office (910.892.1333) and ask to speak to Michelle. Did you know we provide? Copyright © 2019 ABC Pediatrics of Dunn Website Design by: Wat Webs Inc.